If the idea of spending hours on end deep-cleaning the house doesn’t appeal to you, take the “spring” out of “spring cleaning” and try monthly deep-cleaning instead. When you tackle one room in your house each month throughout the year, the only thing you’ll have to think about come next spring is enjoying the weather. January is an ideal month to clean out closets. Go through your family’s clothes and donate anything your kids have outgrown or you haven’t worn in a year or more. Try using space-saving vacuum bags to keep seasonal clothes tucked safely out of the way until they’re needed. February is all about floors. For a deep clean, you’ll need to set the Swiffer aside and go for a more industrial machine. If you don’t already own a floor scrubber or carpet shampooer, it is easy to rent one. Scrub and wax hardwoods and shampoo and deodorize carpets. Tackle the laundry room in March. Clean and deodorize your washing machine. If you store cleaning supplies in the laundry room, check the bottles for leaks and expiration dates. Then, toss out anything that is old or damaged. April’s showers aren’t just about flowers — it’s time to deep-clean the bathrooms. Try this vinegar tip to clean grout and the rest of your bathroom. It may also be time to re-caulk around the tub and sinks. If you’ve been ignoring that slow drip from the sink, go ahead and tighten the plumbing, too. Now that the weather is better, get outside and clean up around the house. Organize the garage and make sure all your lawn equipment is in working order. Clean out the flowerbeds and get the garden ready for planting. June brings warmer weather, so let the sunshine in! 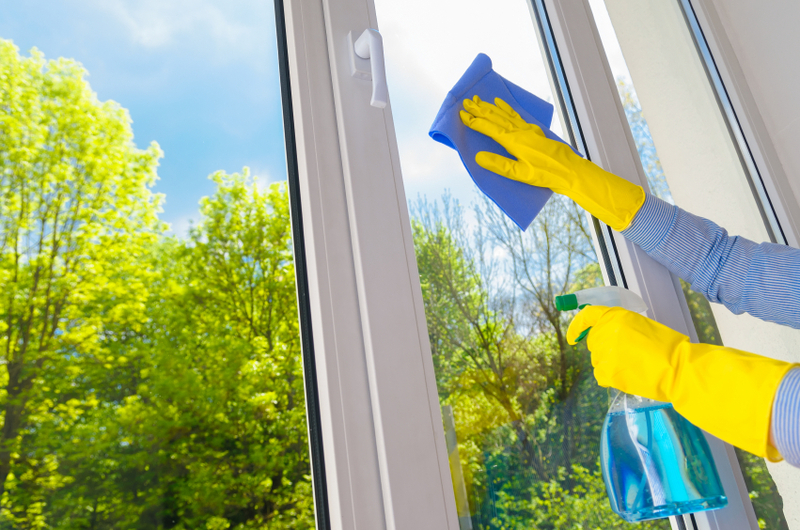 While you’re opening the windows, go ahead and give them a good cleaning. Toss the towels and go for a squeegee instead to get a beautiful streak-free finish. July is the time to focus on the kitchen. This means cleaning the cabinets inside and out as well as the refrigerator and stove. Grab a toothbrush and dig into the creases around faucets. Check the food in the freezer and toss anything that looks bad. In August, it’s all about looking up. Look up at your ceiling fans, lights and vents and get ready to dust and vacuum. Cleaning air vents is especially important if anyone in your family has allergies. You don’t want to be circulating dust and mites through the air in your home. The living and dining rooms are on the list for September. Vacuum all the furniture, wash curtains and pillow covers and dust behind the entertainment center. If you have a china cabinet, open it up and wash the dishes and dust the shelves. O is for October and "office." Take some time to sort through the piles of papers and receipts. File everything you need by month to make tax season a breeze. Get on the computer and clean off your virtual desktop as well. Save photos and documents to an external hard drive to leave more room on the computer for new information. Before you settle in for a long winter’s nap, deep-clean the bedrooms. Vacuum and deodorize mattresses. Clean your pillows according the manufacturer’s instructions. Sweep under the bed and behind the dressers. Break out your winter clothes and pack away the summer attire. It’s time to make room in the playroom. Sort through the toys and toss anything that is broken beyond repair. Replace dead batteries. Gather all the pieces to playsets together and place them in a bin or Ziploc baggie, so when the kids go to play, they will be able to find everything they need. Donate the toys your kids no longer play with. Taking a monthly room-by-room approach to deep-cleaning makes the tasks seem much less daunting. You’ll have a clean house year-round and more free time, too. This was a great post. I’m going to share it with my tenants. Thanks again. Great tips! The suggestions about each month make things quite easy about people who clean their homes by themselves, without a professional help. November tips about deep cleaning are especially important before the winter comes. Thanks for sharing this information!